Marion County sheriff Kevin Williams (standing) speaks to members of the commission on Monday, Feb. 4 during a special called meeting. Pictured are (seated, from left) Dale Holt, Bob Burleson, Kenneth Cochran and Keith Nichols. Not pictured is Tim “Ears” Estes. HAMILTON - Over the past few weeks, a parade of architects, designers and consultants hoping to win a contract to build a new jail in Marion County have presented themselves to Marion County Sheriff Kevin Williams and the Marion County Commission. Representatives from such architectural and design firms as Goodwyn, Mills and Cawood, PH&J Architects, Volkert, Inc. and Hamilton architect Andrea Harbison have all made presentations to the commission. The Marion County Board of Education and Winfield Board of Education have joined school districts across the state in calling for the repeal of the controversial Alabama Accountability Act (AAA). Marion County school board members unanimously adopted a resolution at its meeting on Tuesday, Feb. 12, calling for lawmakers to repeal the act in the upcoming 2019 session, which begins on Tuesday, March 5. The Winfield Board of Education also approved a resolution recommending Legislators repeal the AAA at its Wednesday, Feb. 13, meeting. County officers elected during the 2018 election cycle have all taken their turn in raising their right hand and have sworn to serve the people. The new and returning officers all officially assumed their positions on Tuesday, Jan. 15, not including the elected Marion County Board of Education members, who took their seats in December. The Northwest Alabama Arts Council has announced that Christine Bussler, an artist from Fayetteville, Tenn., has been selected as the featured artist for this year’s JBAF. Her artwork will be featured on the 2019 commemorative T-shirt. Bussler, who is a self-taught painter, is returning to the JBAF for the fifth time. HAMILTON - Commemorative T-shirts for the 17th Annual Jerry Brown Arts Festival (JBAF) are now on sale. The annual JBAF is set for Saturday and Sunday, March 2 and 3, in south Hamilton at the spacious Tombigbee Electric Cooperative facility. Admission is, as always, free and hours are Saturday from 9 a.m. - 5 p.m. and Sunday from 10 a.m. - 4 p.m. The event is sponsored by the Hamilton-based Northwest Alabama Arts Council. Both public school systems in Marion County have gone on the record recommending the repeal of the Alabama Accountability Act (AAA). With the Marion County School System approving its resolution on Wednesday, Jan. 23, and the Winfield City School System following with the same on Wednesday, Feb. 13, leaders of the two school systems left no doubt where they stand. Nor did newly-elected District 17 State Rep. Tracy Estes. HAMILTON - Gears are beginning to turn in preparation for the 17th Annual Jerry Brown Arts Festival which will be taking place on Saturday and Sunday, March 2 and 3. In its normal fashion, the Hamilton City Council voted to waive the city’s business license requirement for vendors at the festival this year at its meeting on Monday, Feb. 4. The artist will still be required to pay city and state sales taxes. Northwest Alabama Arts Council President Tony Williams approached the council during the meeting, noting that the event is a hallmark for the city. 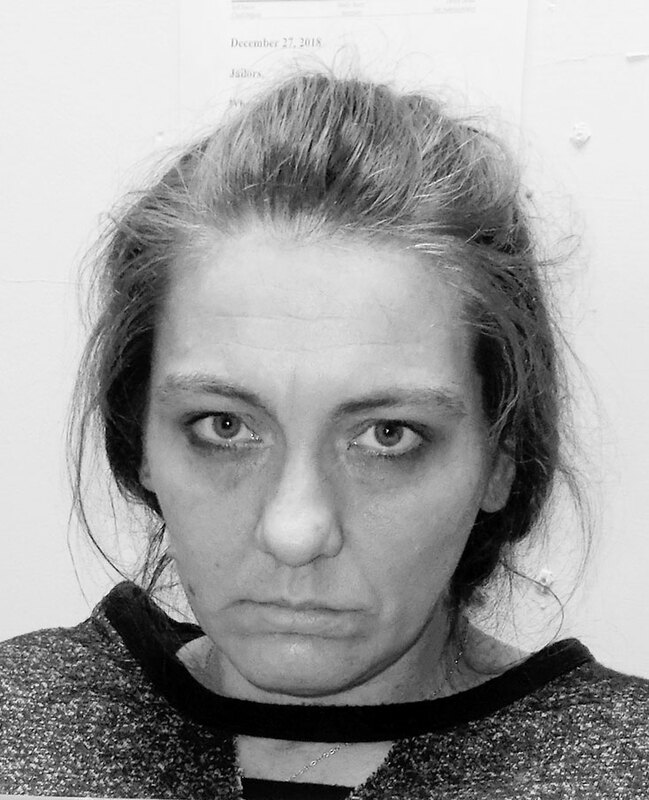 Over a pound of meth with an estimated street value of $40,000 along with an assortment of guns, ammo, spoons and needles and other paraphernalia was confiscated during a raid on a house in Glen Allen on Saturday, Feb. 9. Sgt. Marcus Carroll (left) and Officer Jimmy Galbreath (right) were awarded the Medal of Valor for their actions after an automobile wreck on Dec. 4, 2018. They are pictured here with Winfield police chief Brett Burleson on Wednesday, Feb. 13. WINFIELD - Two members of the Winfield Police Department were awarded the Medal of Valor for saving a wreck victim’s life last December. Sgt. Marcus Carroll and Officer Jimmy Galbreath both entered a burning vehicle to free the unconscious driver from the wreckage. Love’s Travel Stop & Country Store Real Estate Project Manager William Gleason appeared before the Hamilton City Council during its Monday, Jan. 22, meeting to discuss a new truck stop which will be built on Interstate 22’s Exit 14. The Hampton Inn in Winfield has been rated the number one hotel in the state of Alabama by TripAdvisor in 2018. WINFIELD - The Hampton Inn in Winfield has been ranked as the number one hotel in the state of Alabama in 2018 by TripAdvisor. The award is given based on guest scores received through TripAdvisor.com. The hotel opened in February, 2011 and, for six out of the last seven years, has received Hampton Inn’s Lighthouse award for being in the top 5 percent of all hotels in the company. Hampton Inn in Winfield has also received a Certificate of Excellence award from TripAdvisor every year since the location opened in 2011. HAMILTON - The Marion-Winston Community Action Agency (MWCAA) conducted a Point-in-Time (PIT) count on Thursday, Jan. 31, 2019. The PIT count determines the number of sheltered and unsheltered homeless persons on a single night in January and helps the two counties receive funding towards resources and support for the homeless in the area. HAMILTON - Paul Davis, an organizer for the Salvation Army Red Kettle campaign in Marion County, has extended his heartfelt thanks to the city of Hamilton and Marion County for volunteering their time and efforts during the holiday season of 2018. “From Nov. 23 to Dec. 23 of 2018, several dozen of your friends and neighbors stood in front of the Walmart Supercenter in Hamilton next to a red kettle ringing a little red bell in support of the Salvation Army,” said Davis. HAMILTON - The Alabama State Council on the Arts has awarded the Pastime Theatre in Winfield two grants this year totaling $5,700. HAMILTON - Gov. Kay Ivey has awarded a $275,000 grant to help homeless citizens in Northwest Alabama find immediate housing and to assist others who are in danger of becoming homeless. Read more about Volunteers desperately needed in Marion Co.
Marion County Sheriff Kevin Williams was sworn into office for a record sixth time on Wednesday, Jan. 9, at the Marion County Jail in Hamilton. With Williams’ wife, Renee, and their granddaughter, Cara, 4, the daughter of Carl and Lacy Williams, holding the Bible, the sheriff was sworn into office by the official who has performed the ceremony every time since his first swearing-in ceremony in 2003 on his behalf, retired Marion County Judge of Probate Annette Bozeman Haney. HAMILTON- Two long-time county officials have taken their oaths once again to serve the people. Marion County Commissioner District 5 (D-5) Bob Burleson and Marion County Sheriff Kevin Williams are now the longest serving individuals for their respective capacities. Marion County commissioners Keith Nichols (D-1) Kenneth Cochran (D-2), Dale Holt (D-3), Tim “Ears” Estes (D-4) and Burleson were all seated after taking oaths at a ceremony on Wednesday, Nov. 14, 2018. HAMILTON - Members of the Marion County Board of Education are voicing their concerns over state laws which “divert” education funding to private schools. Some of the officials are hoping that lawmakers consider toppling Alabama’s Accountability Act (AAA), which passed in 2013. WINFILED - Winfield City Schools Superintendent Chris Cook has a plan in place to improve his system’s school report card, he said at the WCS Board of Education meeting on Tuesday, Jan. 8. Northwest Alabama Council of Local Governments (NACOLG) Planning and Transportation Director Jesse Turner told the Marion County Commission that the regional agency has found than $10 million in additional funding for Northwest Alabama while confirming addresses for the Census Bureau in preparations for the 2020 Census. Turner said that every counted individual equates to about $1,600 in grant money an area can claim. HAMILTON - Marion County residents should be readying themselves to participate in the upcoming Census. Local officials are already being briefed on the vital and rapidly approaching decennial Census in 2020, which will determine the amount of funding and congressional representation Alabama can lay claim to for the next 10 years. January was School Board Recognition Month and area principals appeared at the Marion County Board of Education’s January board meeting on Wednesday, Jan. 23, with student-made cards and gifts to thank the local education officials. “I think we have an excellent board and I’m grateful for each one of you and what you do for our students,” said Marion County Superintendent of Education Ann West. Marion County District 2 (D-2) Board Member Joyce Fowler (left) is shown receiving students’ gifts from Guin Elementary School Principal Josh Weatherly (front, right). Also shown is D-4 member “Coach” Don Jones (center) and D-3 member Daryl Weatherly. HAMILTON - December 2018 saw the most sales tax for education on record collected for the month of December. Marion County Superintendent of Education Ann West told the Marion County Board of Education during its meeting on Wednesday, Jan. 23, that sales tax for December 2018 collected nearly $20,000 more than the previous year. This marks the fifth-consecutive month of record-breaking collections for the county school system. Ivey announced the grant funding on Wednesday, Dec. 26, which is a portion of a larger $2.5 million distribution to 14 government and community agencies. The funds are from the Emergency Solutions Grant program, whose funds are available through the U.S. Department of Housing and Urban Development. 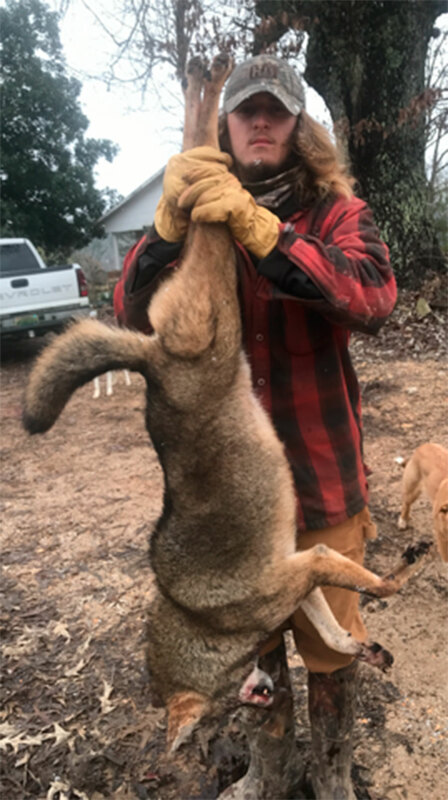 Local trapper Derek Palmer displays a large coyote that he trapped on the Buttahatchee River northeast of Hamilton on Dec. 10. 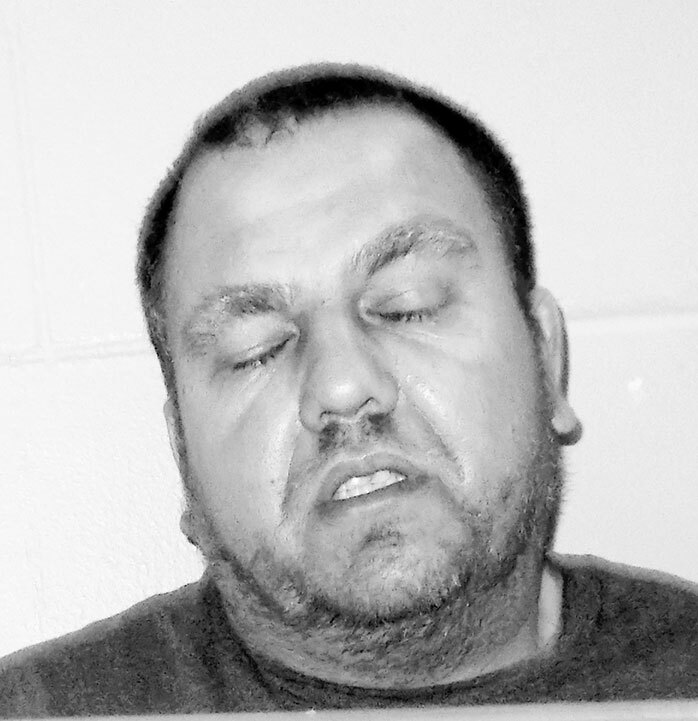 Palmer said the animal weighed upwards of 60 pounds. “Some people say it’s a coywolf—a half-coyote and half-wolf cross. I don’t know. It just has a wolf look to it,” Palmer said. 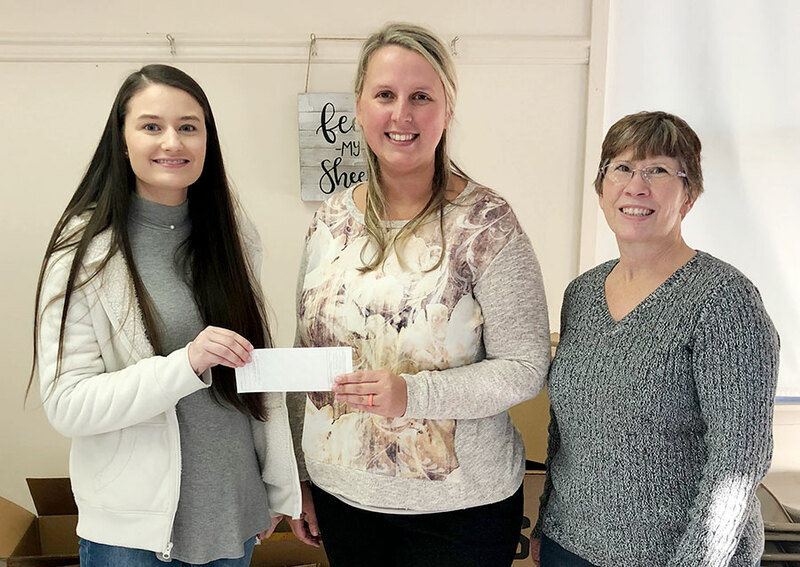 Alabama Power Service Organization Coordinator Tracey Carter (center) is shown presenting a $750 check to Jayda Stinnett, one of the three Marion County High School seniors who helped found the non-profit Feed My Sheep food pantry in Guin.